We arrived in Oomaru, part of our as-yet-mostly-unblogged ten day road trip through New Zealand's south island, in order to watch as the famous blue penguins made their way back to their nests. I wish we'd had more time to spend, because the city is as quirky, cute and fascinating as its flightless waterfowl. Let's get this out of the way: the blue penguin may be the cutest creature ever, or at least cutest thing created by God as opposed to Hayao Miyazaki . Actually, there's more than a little influence of Miyazaki in the blue penguin, as well as traces of Disney and Charlie Chaplin. The smallest breed of penguin in the world, they stand about twelve inches high, and are apparently as graceful in the water as they are clumsy on land. Their short stature makes it difficult for them to climb the steep hillsides rising out of their oceans to their nests. Intensely communal, they twist and turn their heads while looking at each other in a manner that begs for a voice over from a British comedian . To top it all off, they can't see yellow light. This last disability is what allows them to be a major tourist draw. Every year they return to their nesting area to raise their new chicks. Proud penguin parents journey out into the ocean by day to scoop up small fish, and return each night under what they think is the cover of darkness to feed their young. The locals of Oomaru have cunningly constructed a giant stone ampitheater right next to the nesting area, allowing spectators to observe the progress of these penguins back to their nests under intense yellow spotlights. Continue reading Spawning, Steampunk, and other Victoriana (Oomaru, New Zealand, November 8-9, 2010). Here are a few pictures of strange and interesting signs that haven't really fit in any other entry. 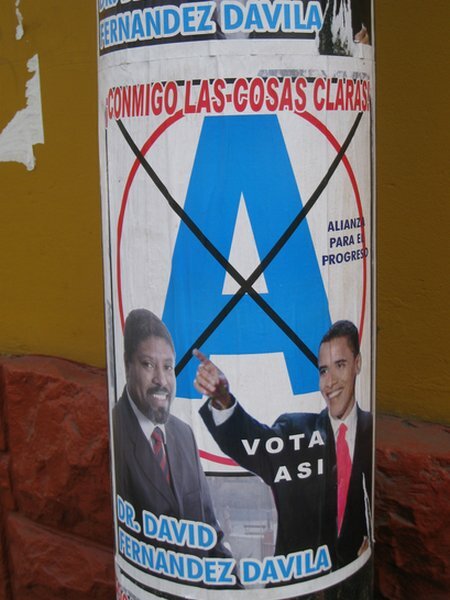 Forgive my cynicism, but I somehow doubt that President Obama actually endorsed Dr. Davila. Continue reading A miscellany of strange and interesting signs. We caught word of the tragedy in the Pike River mine yesterday. We did not get as far north as the mine in our travels, making it only as far as the the Franz Josef Glacier. But ever since learning of the trapped miners we have been keeping watch on the news. I know that mine rescues are dangerous ventures unlikely to succeed, but I had irrationally expected this one to work out. Part of this was undoubtedly bias at having watched the Chilean miners be triumphantly rescued, but it also stemmed from the sense that this was New Zealand, and bad news didn't happen there. In the middle of our van trip across the country, we'd had a rough day in Christchurch. 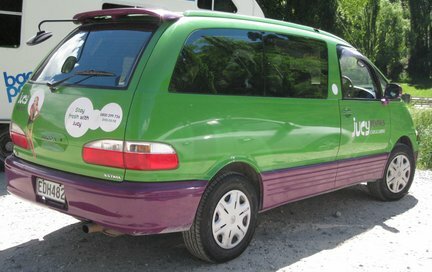 The cooler in the van had failed, resulting in spoilt milk and a two hour delay at a Jucy Rentals location. But we were finally on the road and receiving an unusually strong radio signal from a station broadcasting a news program that sounded like NPR down under. The top two stories? An outbreak of disease had struck the nation's kiwi fruit crop, and a school bus driver had been shot. But this was not an American school yard shooting: the driver had been hit by a pellet gun, and, as the announcer sternly informed us, was receiving medical treatment. I don't mean to say that these are not serious concerns. Agriculture makes up a large percentage of New Zealand's exports, and kiwi fruit are a major crop. The bus driver was doubtlessly traumatized and in pain. But after a few years of the crime, corruption and financial crisis that make up the nightly news in New York, New Zealand's reporting was comfortingly somber and calm. But if city officials ask Corley to relocate, as political winds blowing through Detroit indicate they soon might, she's not budging. If this desperately poor city is no longer able to provide services to the neighborhood -- trash pickup, fire protection -- "we'll just have to deal with it," she says. Just as she had to deal with the discovery of a man's burned torso in the underbrush across the street a few months ago. Betty Corley says she won't move away, but other isolated homeowners don't share her loyalty. Cynthia Ciesiolka, who lives on the next block with her four grandchildren, says if the city offered her $5 and a place to live, she'd be gone tomorrow. (emphasis mine) It's a shocking return to Detroit "normalcy" to see the discovery of charred body parts relegated to a minor paragraph, when one has been driving through a country where pellet-gun assault is lead local radio news. So when I heard about the miners, I thought that only the Chilean best-case scenario was probable. Yet as lovely as New Zealand is, it is not immune from misfortune. Sadly, I was wrong, and our hearts are with the families of those who were lost. Welcome to New Zealand. Please don't die. As I've mentioned, New Zealand looks a bit like heaven's back lot: every twist around a mountain road reveals another magnificent valley, until the path goes far enough east and runs into Kaikoura and miles of azure coast. The question isn't why they shot The Lord of the Rings here. It's why one doesn't treat every movie, from A River Runs Through It to Leprechaun 6 - Back 2 Tha Hood , as an excuse to shoot New Zealand scenery. 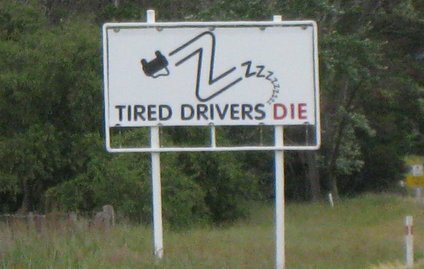 Given the idyllic ambiance, New Zealand's highway safety signs come as a bit of a shock. (I imagine that they thought having the red letters drip with blood would be a bit too over the top.) Another shows a cross atop a grave, with the tag line "If it's a race, this is the finish line." The overall effect is to give one the impression that New Zealand's roads are deadly wastelands, strewn with the wrecks of unwary, careless, or inebriated drivers. Continue reading Welcome to New Zealand. Please don't die..
Greetings from New Zealand, where our home for the next ten days looks like this. The back roads of New Zealand are littered with camper vans of various sorts and sizes, and every roadway holds dozens of picnic spots. When God handed out geographic bonuses, New Zealand got an obscenely unfair share of gorgeous green landscapes, picturesque views and New Yorkers-can-only-be-envious sunshine. 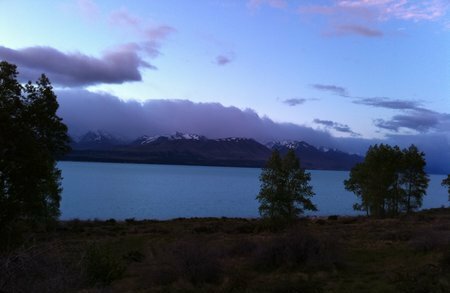 Yesterday we made our way from Queenstown to Twizel, and I found myself challenged to keep my eyes on the road instead of the landscape. Like a mousy girl jealous of the high school beauty queen, such majesty makes it tempting to seek for some cosmic source of fairness. "Sure, New Zealand's got great summer scenery, but it must have a horrible personality." Nope. It's friendly, cheaper than its big cousin Australia, and actually has (a few) places with free wireless. Weather, however, is the great equalizer of landscapes, and we woke this morning to the patter of rain on the top of the camper. It hasn't let up, which means today will make a good day for laundry, stocking up on equipment, and blogging.